NEW YORK, KNOPF, 1970, 1970. INSCRIBED BY FEJES, WITH AN ALS ON A XMAS CARD; DUST JACKET FIRST EDITION VERY GOOD. Signed by Author(s). F. Hardcover. New York: This is a Borzoi Book/Alfred A. Knoph, Inc, 1966. 1st Edition. Original Cloth. Near Fine/Fine/Near Fine. Fejes, Claire. Type: Book 1966/Stated 1st Edition/1st Printing/Priceclipped Dustjacket/Illustrated By The Author/368 Pages/Mylar Sleeve.. "A personal narrative in text and drawing by an artist-writer who shared and recorded the daily lives of the Eskimos who became her friends during five long visits to the coastal and inland villages of Alaska's northwest area. The cover has a touch of spinewear. The pages are clean, crisp, and white, without any writing or marking in the text. There is a prior bookseller's note on the FEP. New York: Alfred A. Knopf, 1967. Second Printing . Hardcover. Very Good/Fair. 8vo - over 7¾" - 9¾" tall. Claire Fejes. The fruit of 5 long visists made to Alaska's remote N.W. coast to sketch & paint the Eskimos and to share their daily experiences. Concerning a personal narrative of the summer settlement, Noatak, Eskimo whose economy centers chiefly around the hunting of the great bowhead whale. Very Good/Fair pictorial dust jacket; w/haeavy wear at head of spinestrip, one closed tear at bottom edge, tiny dings to corner tips, mild wear to clean cloth boards, stamped w/author's illustration of Eskimos & Dog Sleds, Author's Inscription on front endpaper, double frontis & title, map facing Contents pp., Profusely & WONDERFULLY illustrated w/drawings, includes notes on the Type and Author, 368 clean, crisp & solid pp. Knopf. Hardcover. 0394442075 New Condition. . New. Volcano Pr. PAPERBACK. 1884244009 New Condition. . New. New York: Alfred A. Knopf, 1966. SIGNED BY THE AUTHOR. A clean, unclipped and unmarked copy in a Brodart jacket cover.. Signed. First Edition. Hard Cover. Fine/Near Fine. Illus. by Claire Fejes. Octavo. New York: Alfred A. Knopf 1966, 1st edition. (Hardcover) 368pp. Very good in very good dust jacket. Illustrated white cloth covers with purple spine. Map, illustrations. The dust jacket is price clipped. "A personal narrative in text and drawing by an artist-writer who shared and recorded the daily lives of the Eskimos who became her friends during five long visits to the coastal and inland villages of Alaska's remote northwest area.". Illustrations by Claire Fejes. Locale: Alaska. (Indians, Art, Eskimos, Hunting and Fishing, Inuit, Noatak, Whale Hunting). NY: Alfred A. Knopf, 1967 fine/very good. out of print. Illustrated by Claire Fejes. second issue edition. Binding is cloth..
Volcano Pr. PAPERBACK. 1884244009 Like New Condition. . Fine. Knopf. Hardcover. 0394442075 Like New Condition. . Fine. New York: Alfred A. Knopf. Hardcover. 1966. 1st Edition. 8vo 368pp . Very Good in Very Good DJ. B&W Illustrations DJ price clipped Personal narrative by an artist-writer who recorded the daily lives of the Eskimos in Alaska's remote northwest region . Alfred A Knopf. Very Good in Very Good- dust jacket. 1966. First Edition. Hardcover. Dustjacket is price-clipped. ; 8" tall . Random House Children's Books, 1966. First Edition. Hardcover. Very Good. Disclaimer:A copy that has been read, but remains in excellent condition. Pages are intact and are not marred by notes or highlighting, but may contain a neat previous owner name. The spine remains undamaged. At ThriftBooks, our motto is: Read More, Spend Less.Dust jacket in good condition. First edition. SIGNED and inscribed by the author. Minor shelf and handling wear, overall a clean solid copy with minimal signs of use. Binding is sound. Pages are intact and free of marks. Dust jacket colors are crisp and bright. Secure packaging for safe delivery.Dust jacket quality is not guaranteed. Epicenter Press, Incorporated. PAPERBACK. 1935347470 . New. Epicenter Press, Incorporated. PAPERBACK. 1935347470 Remainder mark . Fine. Epicenter Press, Incorporated. PAPERBACK. 1935347470 Special order direct from the distributor . New. Alfred A. Knopf, 1966. HB--FN, gray cloth cover with purple spine / inscribed by author / contains maps; illustrations;. Signed by Author. Cloth. Fine+/Good. Illus. by Fejes, Claire. Volcano Pr, 1994-03-01. Paperback. Used:Good. NEW YORK: ALFRED A . KNOPF, 1966. 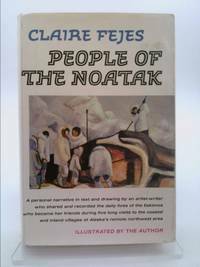 THIS IS A VERY GOOD HARDBOUND FIRST EDITION OF THIS SCARCE AND IMPORTANT BOOK...PEOPLE OF THE NOATAK...BY CLAIRE FEJES....A PERSONAL NARRATIVE IN TEXT AND DRAWING BY AN ARTIST WRITER WHO SHARED AND RECORDED THE DAILY LIVES OF THE ESKIMOS....ILLUSTRATED BY THE AUTHOR...368 PAGES OF TEXT AND DRAWINGS...A VERY GOOD COPY IN A VERY GOOD BUT SOILED DJ...PROTECTED BY A BRO DART PLASTIC PROTECTOR...THIS COPY HAS BEEN PERSONALLY SIGNED AND INSCRIBED THE AUTHOR ARTIST CLAIRE FEJES....SCARCE AND IMPORTANT AND PRICED LOW....F IN SIGNED BOOKS. SIGNED INSCRIBED BY CLAIRE FEJES. FIRST EDITION. HARDBOUND. Very Good/Very Good. Illus. by DRAWINGS ETC. OCTAVO. Eskimo HISTORY. NEW YORK: ALFRED A. KNOPF. VG/VG- INSCRIBED TO PREV. OWNER & SIGNED BY AUTHOR. Pages: 371. . 1970. 3RD PRINTING. HARDCOVER.. FAINT SOILING AT HEEL. DJ EDGEWORN. TEXT CLEAN, BINDING TIGHT. . Condition: VG/VG- INSCRIBED TO PREV. OWNER & SIGNED BY AUTHOR. Pages: 371. Volcano: Volcano Press [1-884244-00-9] 1994, 1st thus. (Mass market paperback) xii, 368pp. Very good. First published in 1966. Interior artwork by Author..
Knopf Inc. Very Good/Jacket Has New Mylar Cover. 1966. First Edition, Stated. Hard Cover. Signed by Author ------------------Purple cloth spine and gray covers with line drawing on cover of dog sled, book is 8 1/2" tall. 368 paages----------------VERY GOOD CONDITION- - dust jacket chipped and now protected by new mylar cover-- - - SIGNED AND INSCRIBED BY AUTHOR- - - - . Alfred A. Knopf. 1966. 1st edition. Polar Exploration. VG/VG..
Alfred A. Knopf, 1967. Hard cover. Good in good dust jacket. Signed by author. Knopf. Hardcover. 0394442075 Hardcover in dust jacket, minor wear, previous owner book plate and inscription on front end papers, binding tight and pages bright, a nice copy! . Good. 1966. Knopf, 1970. Book. Near Fine. Hardcover. Inscribed by Author(s). Edge wear and couple tape repairs to jacket..
U.S.A.: Knopf, 1970. Signed by Author. Third Printing.. Hard Cover. Very Good/Good. NY]: Knopf. NEAR FINE book, VG DJ(in Mylar). Bright book & DJ. FINE inside. 1966. 1st edition.. Hardcover..
New York: Alfred A. Knopf, 1966. 368 pp., illus. Slight lean to spine, crown lightly pulled, corners of boards lightly bumped, page edges tanned and lightly soiled, book plate on front free endpaper. Jacket lightly dustsoiled, handled, edgeworn. Size: 8vo. 1st.. Hardcover. Good/Good. Volcano Pr, 1994-03. Paperback. Good. Trade Paperback. Volcano Press. Unless Listed in this decription, VG or Better. Knopf. Used - Acceptable. Former Library book. Shows definite wear, and perhaps considerable marking on inside. Alfred Knopf, 1966. 1st Edition . Hardcover. Near Fine/Very Good. This is a First Edition. This copy is Near Fine in a Very Good dust jacket. Volcano CA: Volcano Pr. 1994. vg-. Paperback. ISBN:1884244009 8.25" tall; 369pp; b/w drawings, some full-page; color il on front cover; a new edition of a 1960s classic; reading creases to spine & light crease top corner front cover . Random House Children's Books, 1966. Hardcover. Good. Disclaimer:A copy that has been read, but remains in clean condition. All pages are intact, and the cover is intact. The spine may show signs of wear. Pages can include limited notes and highlighting, and the copy can include previous owner inscriptions. The dust jacket is missing. At ThriftBooks, our motto is: Read More, Spend Less. Random House Children's Books, 1966. Hardcover. Good. Disclaimer:A copy that has been read, but remains in clean condition. All pages are intact, and the cover is intact. The spine may show signs of wear. Pages can include limited notes and highlighting, and the copy can include previous owner inscriptions. At ThriftBooks, our motto is: Read More, Spend Less.Dust jacket quality is not guaranteed. volcano press, 1994. Paperback. Good. Disclaimer:A copy that has been read, but remains in clean condition. All pages are intact, and the cover is intact. The spine may show signs of wear. Pages can include limited notes and highlighting, and the copy can include previous owner inscriptions. At ThriftBooks, our motto is: Read More, Spend Less.Dust jacket quality is not guaranteed. Volcano Pr, 1994. Trade Paperback. Good. Softcover. Sound & good copy, light to moderate rubbing/edgewear to wraps, clipped, thumbing wear, creasing at spine.